If your cruise starts or ends in Whittier, you’re in a prime spot to explore more of Alaska. 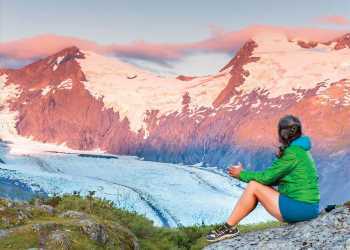 From wild animals to majestic mountains, strike out for adventure with a trip through Southcentral Alaska before you board or after you arrive. Your time aboard ship is just part of the voyage! Head for the Corner of Fourth Avenue and F Street for the lowdown on Anchorage. The Alaska Public Lands Building is a great information center with wonderful data and maps about Alaska’s national and state parks, as well as museum displays, and informational videos and movies about Alaska. Catch a movie on Alaska animals, the Iditarod, or the awesome geological forces that forged mountains and carved glacial valleys. Grab a reindeer sausage from one of the many street vendors, or find a quick, casual meal at a nearby restaurant. Head over to the Anchorage Museum and get an overview of the state’s history, art and culture. The Smithsonian Arctic Studies Center has 600 rare Alaska Native items drawn from each of Alaska’s cultural groups. Stretch your legs with a bike ride or walk along one of Anchorage’s accessible paved trails. The Tony Knowles Coastal Trail follows the shores of Cook Inlet for 11 miles, and offers amazing views from almost every point along the way. It also ties into an extensive network of paths and trails; bike rentals are available downtown if you are ready for a longer ride. Looking for one-of-a-kind items? Check out hats and scarves made from musk ox wool – known as qiviut – as well as Alaska Native artwork, hand printed apparel, jewelry, wood crafts and more! Browse galleries, or get down to the Anchorage Market & Festival, held each Saturday and Sunday throughout the summer. Explore the charming town of Talkeetna. It began as a frontier trading post, and today it’s the starting point for Denali climbing expeditions. The mountain looms large in Talkeetna, even for non-climbers. Make waves with a rafting trip or jet boat safari and gain another perspective on the Alaska Range and the three rivers that join near the town. Your unforgettable day ends back at your accommodations in Anchorage. The salmon are running! Ship Creek has king and silver salmon runs during the summer and is steps away from downtown hotels. The viewing platform offers easy views of the salmon surging upstream. Want to get in a few quick casts? Nearby outfitters can set you up for an hour or an entire day of fishing. The trip to meet your ship departs, but there’s much more to see along the way. The turnouts along the Seward Highway are great photo stops for landscape shots of Turnagain Arm. A pair of binoculars or a telephoto lens could be handy too; beluga whales ply the waters and Dall sheep clamber up the rocky cliff faces. Before you head through the tunnel to Whittier and board, get a wild sendoff with the animals at the Alaska Wildlife Conservation Center in nearby Portage. Bears, wood bison, musk ox, moose, elk and eagles are among the species that call the center home.